Selecting the right flooring for your house is a pretty big decision. Between durability, price, comfort, resistance to the activities of pets and children, and how it matches with your lifestyle—there’s a lot to think about. So, here’s a quick guide to most popular types of flooring available to homeowners today and what you should consider. When it comes to home design, there are few features more stunning than hardwood floors. The warmth of hardwood breathes life into any home, regardless of décor style. Hardwood is durable and lasts. Whether you prefer traditional colors and grains, such as dark mahogany, cherry or walnut, or prefer more non-traditional tones, such as gray—the possibilities of natural colors are endless, especially with the selections from Shaw Floors. Hardwood can be very easily maintained in the right home—instead of vacuuming for several minutes, just take a dust mop to collect any accumulated dirt. But keep in mind hardwood flooring needs appropriate insulation underneath the house to prevent heat loss or cold floors during the winter. Hardwood floors may be hard to maintain if you have pets running around. Claws from dogs and cats can leave scratches, and pet stains can permanently damage the wood. Consider covering your hardwood floors with an area rug if you have pets, or have a repair kit handy for when Fido or Fifi dig in their claws. Hardwood floors also have less sound absorption, so you may get some slight echoes in your house. Hardwood floors can also be more expensive, due to the high-quality workmanship. There are plenty of options when it comes to carpet, including thickness levels, colors, materials and texture. And, generally speaking, carpeting offers more choices than hardwood flooring. Carpeting can match whatever decorating scheme you have in your house. You can find neutral colors, colors that match walls or even carpets that have a particular motif. Mohawk has a ton of selections in this regard. Carpeting also dampens sound in your room, and keeps your floor warmer in the winter. Feeling the softness of carpeting under your feet makes you feel more relaxed and cozy. Carpeting is a bit higher-maintenance compared to hardwood flooring. You have to vacuum, watch out for pet stains, keep an eye on any spills and look out for high-traffic areas. When you have a lot of people walking around, the carpet may wear down after several years. That means you must replace the carpeting in the room eventually. Tile is a high-quality option that is durable and can last a lifetime. Tile is made of ceramic or other earthy materials. Tiles are baked in an oven at high temperatures, creating a durable finish that lasts for decades. Tile is, perhaps, the most durable flooring you can buy. Tile is generally waterproof, but it can stain if liquids sit one place long enough. Tile is a popular choice for homeowners, and it can even increase your home’s value. Color and design schemes are endless. Just look at Marazzi’s commitment to quality. Tile takes some time to install, so you may have to wait a few more days to enjoy your new floor. It may feel cold to the touch on cooler days, so be prepared to wear socks. Tile may also chip or crack due to dropping something on the floor. Pet claws can leave scratches if the animal digs in claws hard enough. 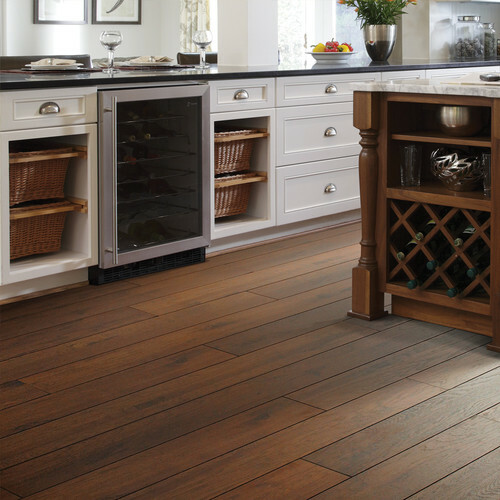 At Primera, we can help you pick the best type of flooring for your home. We partner with a wide range of quality brands to offer a huge choice of flooring products and to suit all budgets. 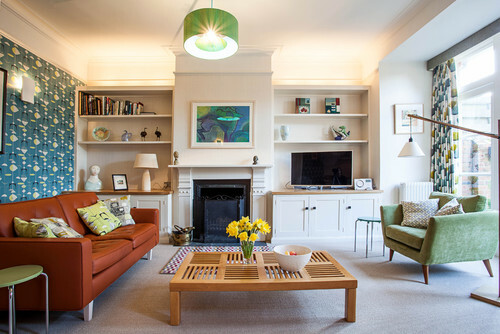 Our expert designers are available to help you create the perfect look for your home. Schedule an appointment today and see how Primera can take your home to a new level. Older PostFebruary Design Trends: Chevron, terrarium planters, picture rails, and more!